Part of a new generation of experimental photographers that utilize the medium for aesthetic ends, Aspen Mays presents an investigation of personal objects for her fist solo show with the gallery. Using a pair of bandanas (one with a starburst pattern owned by her great grandmother and the other bearing white dots and dyed with indigo that was owned by the great American artist Georgia O’Keefe) as her point of departure, Ms. Mays applied pin pricks to the fabrics as a way to transfer their patterns to photo paper. 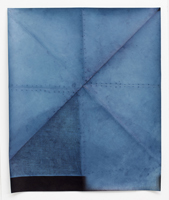 She then used the paper negative to make a photogram (a photographic image made without a camera) and, in the case of several of the works on view, dyed the prints with indigo. The final result poetically references the two women, as well as the artist’s starry night experience working with astrophysicists as a Fulbright Scholar in Chile.